The walking tour of Francistown is conducted by the Supa Ngwao Museum and in my humble opinion, I think it’s the best way to learn about the History of Francistown, its people, the culture and the local cuisine. 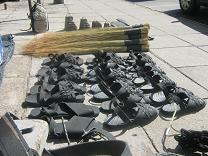 During this tour you'll also discover a really special street where you can get yourself locally made shoes, crafts and jewelry! Stella was born in Francistown and I think there are very few people that know Francistown better than she does... :). I was born and raised in Francistown and i really learnt a lot about "Ghetto"...as the city is sometimes referred to by the youth :). The tour starts at the museum which is housed in one of the oldest buildings in the city. The building (shown below) dates back to 1907 and was built to serve as the District commissioner’s office as well as the magistrates court. Remember that Botswana was under the protection of the British and when the British came in to protect the people of Botswana, they also brought in their army, police, doctors as well as legal systems. Very close to the main museum building are the police station and jails that were used during those colonial times. 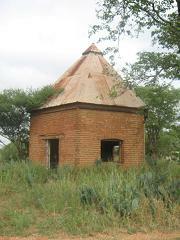 This was the first police station in Francistown (the building below housed the police station). 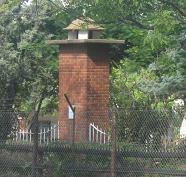 There were two jails(see photo on the right); the one on the right was for blacks and the left one was for whites. The two jails indicate that racial segregation existed in the colonial times and not only in the South African Apartheid regime. Prisoners cooked, helped at the hospital and also did some gardening work. Francistown had the only Airport in Botswana, so the great leader of Botswana landed in Francistown first when he arrived in Botswana. My father once mentioned that he was there when Sir Seretse Khama gave the speech. Apparently it was only after the speech that Seretse was transported to Serowe by car. 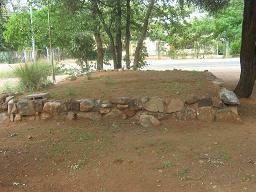 I then got to see the remains of one the colonial Doctors original house. As you can see in the picture below, there isn’t much to see. The really weird shaped house below was first used as the Doctors guesthouse but was later used as the doctors dispensary room. If you look closely to the above photo of the building, you'll notice that it was made of clay bricks which were used during the colonial times. These bricks are really strong. I was really shocked that after a whole century, the house still stands strong. I was really shocked to discover that the place where the market and central park stand today were actually part of the original plan of land sold by the British government in August 1897. Today however the park which was known as Sam Edwards Square is now called the Central park. He was a missionary's son who grew up among Batswana. He was also a hunter and trader. He is most famous for escorting Robert Moffat into Matebeleland to meet King Mzilikazi. Actually Sam Edwards was one the first white men to enter Matebeleland. The monument shown below was erected in the park and served as a memorial of those who served in the 2nd World war. Opposite the Moth Stella showed me what is now known as the Tati House (shown below), but was the original house built for the Manager of the Tati Company more than a century ago. The building was renovated and is now owned by a local accounting firm. Haskins street is one of the first official streets in Francistown and it was named after the Haskins family which was one the families that settled in Francistown during the colonial times. Haskins street was the main street in the colonial times primarily because it lied adjacent to the railway line. Today Haskins street is still one the busiest streets in Francistown. Another really interesting part of the tour of Haskins Street is seeing the steam train located at the end of the street. These trains ran on coal and apparently after riding on one, your legs would be black from the coal. 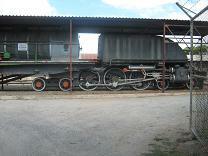 The one above was donated by the Rhodesia Railways for exhibition purposes in Francistown. These trains were used up until 1975, that’s during the times when diesel engines were introduced as better alternatives. Blue Jacket Street is Francistown's busiest street and it runs parallel to Haskin street. Along Blue Jacket, Stella showed me some really interesting buildings that I had previously seen but didn’t know about their historical significance. 1. The first double storey building in Francistown - Apparently is was built in the 1950's and the ground floor was used as a shop, whereas the top floor was a residential area. 2. 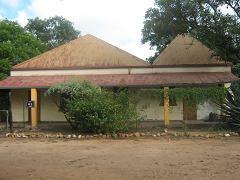 Francistown's first Post office - The building was used as a post office as well as a telephone exchange where people received and made calls using the old phones with cranks. 3. Botswana's first Cash Bazaar Store - Cash bazaar is large clothing store in Botswana and the very first Cash Bazaar store , which by owned by a lady commonly referred to as "Mma Blackie" by the locals, was located along Blue Jacket street. The Francistown tour ended at the market where Stella and met some locals that we both know. If you decide to go on the tour, you'll get the opportunity of having some local tea and food at the market...you'll also get to meet locals and get to know our culture better. If you are visiting Botswana then its a great idea to spend a day in Francistown and take the tour. You can use the form below to contact Stella if you want to go on the walking tour of Francistown.